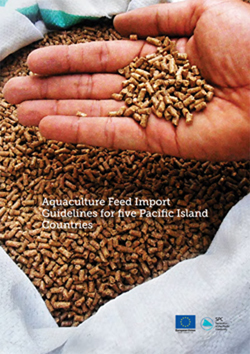 Abstract: Feed is a critical component for successful aquaculture. In many Pacific Island countries and territories (PICTs) feed continues to be one of the major constraints limiting the growth of the industry. Several PICTs have trialled the production of locally manufactured feeds from locally produced raw materials and low-cost bi-products from processing centres. Some examples are tuna flesh or meal, pea meal, flour meal and copra meal. However, there are often limitations in supply due to seasonality, shortage of ingredients, and competition with other mature or traditional livestock industries, such as poultry farms and piggeries. This means that supply is inconsistent and sometimes expensive.